Introduction: Apolipoprotein E4 (ApoE) is a major genetic factor for developing Alzheimer’s disease (AD). It plays a vital role in brain to maintain a constant supply of neuronal lipids for rapid and dynamic membrane synthesis. Aggregation of beta amyloid plaques (Aβ) and neurofibrillary tangles in brain are responsible for onset of AD. The current study is designed to predict a drug against over activity of apoE4. 22 natural compounds (marine, microorganism and plant derivative) were used in current study. Methods: These compounds were used as inhibitors to target apoE4 protein activity. Moreover, six synthetic compounds were docked with target protein to compare and analyze the docking results with natural compounds. S-Allyl-L-Cysteine, Epicatechin Gallate and Fulvic acid showed highest binding affinity (-7.1, - 7 and -7 kcal /mol respectively). Analysis of the docked complex showed that Epicatechin Gallate bonded with Gln156 and Asp35. Furthermore, Fulvic Acid showed hydrogen bonding with Glu27. Among synthetic compound, Tideglusib had highest binding affinity with target protein but did not show hydrogen bonding with any amino acid residue. Moreover, a natural compound S-Allyl-LCysteine also showed highest binding affinity but did not show hydrogen bonding with any amino acid residue. Results and Conclusion: Our study highlighted Epicatechin Gallate as a potential lead compound on the basis of binding affinity and hydrogen bonding to inhibit the progression of AD. 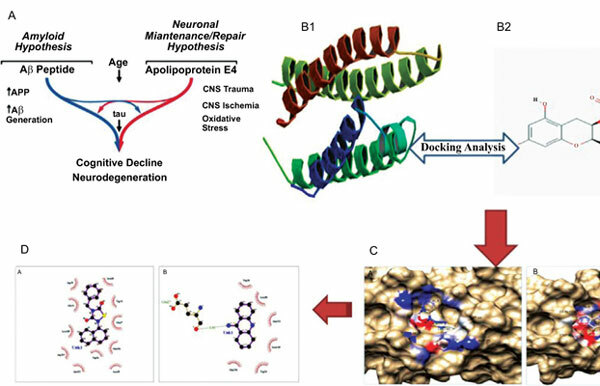 Keywords: ApoE4, Alzheimer's disease, docking, bioinformatics, Cysteine, Epicatechin Gallate. Keywords:ApoE4, Alzheimer's disease, docking, bioinformatics, Cysteine, Epicatechin Gallate. Abstract:Introduction: Apolipoprotein E4 (ApoE) is a major genetic factor for developing Alzheimer’s disease (AD). It plays a vital role in brain to maintain a constant supply of neuronal lipids for rapid and dynamic membrane synthesis. Aggregation of beta amyloid plaques (Aβ) and neurofibrillary tangles in brain are responsible for onset of AD. The current study is designed to predict a drug against over activity of apoE4. 22 natural compounds (marine, microorganism and plant derivative) were used in current study.